How to Obtain a German Drivers License? Study, Study, and Oh Yeah — Study! Wo bin ich gewesen? Where have I been? That is a great question. When I started this blog, I either had downtime in an airport or hotel or was just starting the new job in Germany, so free time was a luxury.. With me now being 7 months into my new job and 9 months into Germany, we have seemed to settle down into always being busy lately. As a result, I am behind in posting to this blog. In fact, most of my free time on the weekends had been spent studying for my German driver’s license. This blog post provides a general summary to explain what’s involved with getting a German Driver’s License. NOTE: These are the general steps that I experienced, and this is by no means meant to be a comprehensive list for anyone else. A new resident of Germany has 6 months that you can drive with your home country’s license. Some licenses from certain States in the US will allow you to turn over your license and receive a German one. Licenses from other States require either a German written (computerized) exam and/or a German road test. Guess which category my New Jersey license fell? Yep, in the category of both written & road….arg! So, you have to register with a Fahrshule (Auto Driving School) and obtain access to an online portal to review the 910 possible questions that can appear on a 30 question / multiple-choice exam. Luckily, the exam can be taken in English, however it is British English and there are some differences in terminology. 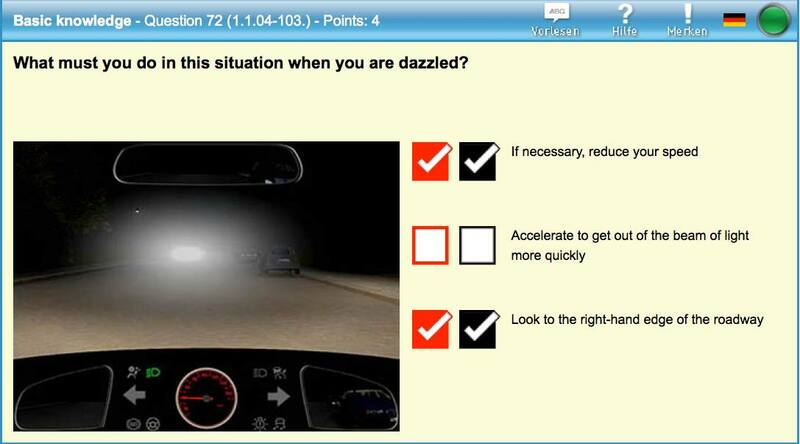 My favorite is what to do at night with on-coming traffic with lights that ‘dazzle’ you. And, no, waving jazz hands back is not the correct answer! Studying sounds easy enough, especially since I have been driving for 25 years! But, knowing that Germany has a lot of regulations with a lot that differ from the US, you really do have to put in the effort! Once you feel confident you can pass, you then schedule to take the exam through the Fahrshule at the auto authority. I passed my first time! Next, I needed to prepare for the road test. I contacted the Fahrshule and arranged to meet with a driving instructor who picked me up at my apartment. After our hour long drive, he said I did okay, but needed to schedule two more (90 minute) sessions with him before the actual test. 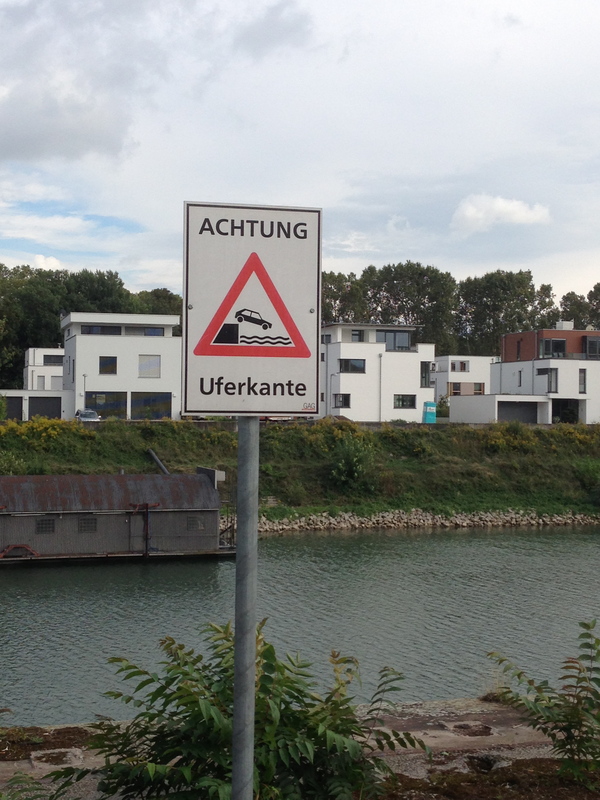 There are so many road signs that are standard across Europe, but look nothing like those in the US. The meanings may be the same, but mostly there are differences. Like the above sign. Looks confusing for those of us from the States with all the symbols! 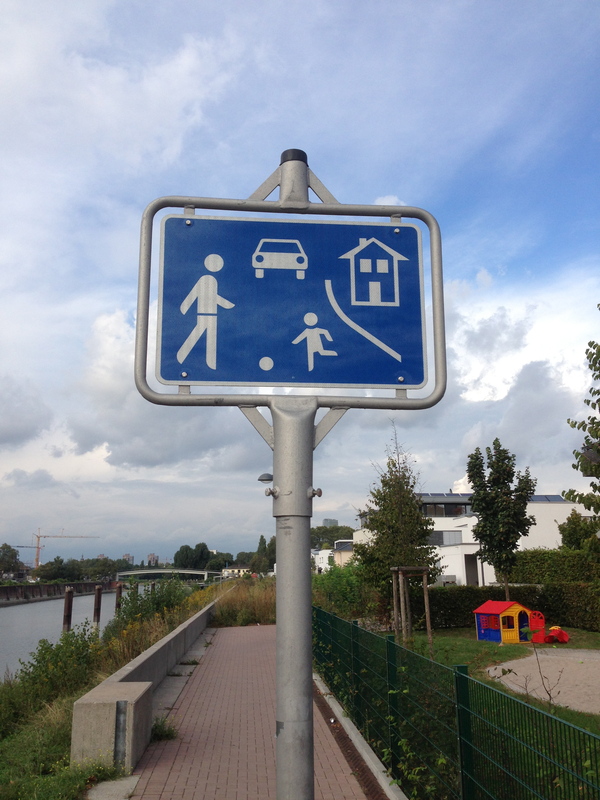 But, it is basically “Caution Children at Play” but also means a very pedestrian area. You are allowed to drive here, but only at “idle speed” which means do not use any of the gas pedal until you see the same sign with a red diagonal through it, indicating the end of this zone. Also, since in Europe there are many trams, buses, pedestrians and bicyclists, there are regulations to protect them and therefore precautions a driver needs to know. It is amazing how much of a bad habit I have developed in not turning my head to look before turning or switching lanes! And, just to clarify, only in the United Kingdom does one drive on the left side of the road. So, at least, I did not have to worry about overcoming that challenge! One of the biggest differences between Germany and the US regarding traffic rules are at intersections!! In the US, there are either traffic lights or stop signs to regulate the flow of traffic through an intersection. Sometimes there are 4-way stops. Very few intersections have no signs, which the next time I am home in the States will verify. At 4-way stops, the driver yields to the first person that enters the intersection and then to the driver on the right. In Germany, there are traffic lights, and there are stop signs…..but most times there are none, especially on smaller streets. The main road, where most of the traffic flows, is called a ‘priority road’. This road has priority when driving through intersections (meaning you do not have to stop). You know you are on a priority road when you see road signs with a yellow diamond at the intersection. A car approaching a priority road intersection that is not on the priority road needs to stop & yield to traffic. However, in most situations neither road is a priority one, therefore as you drive into an intersection (large or small), the driver has to yield to traffic coming from the right. And, if you do not pay attention, a car will come through the intersection to cross or turn in front of you, which can be startling when you are driving full speed. This way of driving is the one thing that takes a while to learn to recognize and perform correctly….and the instructor will definitely let you know when you do not yield properly in both body language and German curse words! Once the practice drives are complete, it is now time for the 45 minute test drive. The instructor is in the passenger seat and the tester is in the backseat. The tester spoke little English, but I easily could understand when he asked me to turn right, left or continue straight. Luckily, I had a great instructor who had already taken me down the typical roads I would go on during the test, and I passed after my first test. Once passed, I could now go pickup my German Driving License! Oh, and at the same time as studying for the exam, you have to register and attend a 6 hour first aid course. It is the law in Germany that if you come upon or are involved in an accident, you have a responsibility to perform first aid and make the scene safe before calling for help. In the US, we call 9-1-1 first and may or may not help!? Also, regarding drinking and driving…do NOT even think about it here!! In the US, the blood-alcohol limit in most States is 0.08. In Germany, if you are 18-21 or within the first two years of driving with a new license, it is 0.00, and then after that it is 0.03, and in some instances you have to pass a psychological exam to even attempt to get a new license afterward. Makes sense to have very strict laws regarding drinking & driving, especially in a country that loves its fantastic beer and wine!! And, considering the speeds on the autobahns!! Now that this time-consuming endeavor is beyond me, I can now get back to keeping this blog updated about our experiences traveling and living in Germany…..until next time!